Howard was appointed Chief Executive of BSI Group in January 2009. He has played a leading role in developing a new generation of standards to help organizations become better governed and more responsible. In 2017, for the 18th consecutive year, BSI achieved record revenue of £473m and an operating surplus of £59.5m. In this interview, Howard talks about trust being at the heart of this independent, not for profit company that has been in existence for over a century with a distinctive self-owned and self-governing structure. Integrity absolutely resonates with BSI and its clear that the company is continuously working at being consistent (Habit No.3) throughout their global organisation. 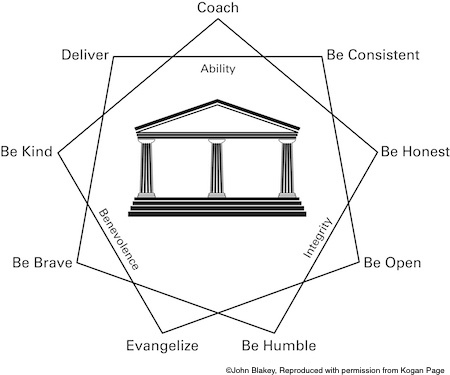 They choose to coach their staff (Habit No.2) as the vehicle for doing that. Choosing to be brave (Habit No.8) in BSI’s world means taking on difficult challenges in the high-end medical devices business, in the food safety business, in the pharmaceutical industry, and in the aerospace industry. These are high risk, heavily regulated industries where the people in BSI are helping their clients to save people’s lives. Trust is an ever-growing differentiator for BSI in attracting the talent they need. BSI is growing at 10-15% a year and its employer brand needs to be very strong. “Who they are”, and their values are important to millennials and generation Y who will have a more varied career path than previous generations. When people leave BSI to further their career, the success of the brand will be reflected in how evangelical (Habit No. 7) they choose to be about the BSI. In the world of social media employer brand is so important, and in the goldfish bowl of the modern workplace, if you don’t tell people what you’re doing and what you stand for, they’re not going to come and work for you. Howard expresses his evangelism for business to the next generation through his involvement in “Speakers for Schools” where he is helping to dispel the media’s huge negativity about business – The “fat cats”, the bankruptcies, the corporate fraud. He talks to 15-18 year olds in inner city schools, where a lot of young people perhaps don’t have role models, about careers in business and what a fantastic opportunity business offers to travel and learn, and how stimulating it can be. In Howard’s words, “If business doesn’t shout about it, no one is going to do it for us”. Bringing the good news about all that’s good about business is what the Trusted Executive Foundation is passionate about too!